A corneal ulcer involves a loss of tissue in the cornea (transparent covering) of the eye and can be caused by trauma (bumps or scratches), a foreign body, or abnormal eyelashes (distichia or ectopic cilia). 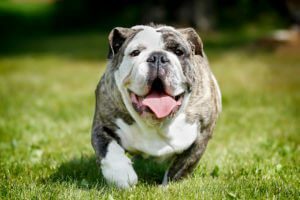 They may develop in any breed, but dogs with short faces and prominent eyes (including pugs, bulldogs, shih tzus, Boston terriers, etc.) are at greater risk due to increased corneal exposure and decreased corneal sensitivity. These dogs often blink incompletely or sleep with their eyes open, decreasing the spread of tear film. In addition to lubricating the cornea, the tears also have an antimicrobial quality that prevents infection. To better understand corneal ulcers, it is important to understand the structural anatomy of the cornea. Endothelium – The innermost layer of the cornea; only one cell layer thick. The surrounding epithelial cells spread out as a sheet to try to cover the ulcer bed. This epithelial sheet adheres to the ulcer bed. The adhered epithelial sheet replicates to make a new, strong epithelial layer. There are certain superficial ulcers that do not heal within a week of therapy. These are called indolent ulcers. Other names for this type of ulcer include refractory ulcers or spontaneous chronic corneal epithelial defects (SCCEDs). These are chronic ulcers that can take months to heal. 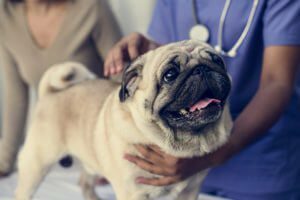 This type of ulcer typically affects middle-aged to older dogs. Boxers often develop this condition and may be affected at an earlier age than other breeds. The cause of indolent ulcers is unknown; however, dogs with this condition have been found to have an abnormal layer in the outer portion of the corneal stroma. It is thought that this abnormal layer prevents normal adhesion of the epithelium to the underlying stroma. Simply blinking the eyelids may cause the epithelium to pull away from the corneal surface resulting in an ulcer. Several treatment methods exist for indolent ulcers. All treatment methods involve rubbing the loose epithelium off with a cotton swab (debridement). 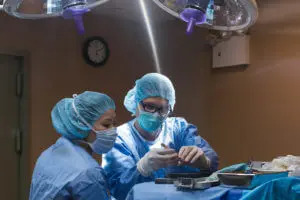 Following debridement, most clinicians recommend a procedure to either remove the abnormal layer of the superficial stroma or a procedure to cut through the abnormal layer to give the epithelium specific places where it can stick down. Removal of the abnormal layer of the stroma can be performed with a diamond burr, which is similar to a tiny Dremel® tool designed for the eye. This procedure, called a superficial keratectomy, treats the entire cornea and may result in less scarring than other treatment methods. Another procedure involves making tiny scratches or pricks through the abnormal stromal layer with a blade or needle (called grid keratotomy or anterior stromal puncture). By scratching through the abnormal layer the epithelium has specific points where it can stick down. Our goal is to stimulate the ulcer to heal quickly both to alleviate discomfort and because shorter healing times may result in less scarring of the cornea and better vision. Surgery typically stimulates the ulcer to heal within 2-3 weeks. Approximately 50% of dogs that develop an indolent ulcer in one eye will subsequently develop it in the other eye. Complicated by a concurrent ocular condition. Complicated corneal ulcers begin as a simple corneal ulcer. Once the protective epithelial layer is gone, the ulcer may become infected with bacteria. The bacteria produce degrading enzymes that break down the cornea. This condition is called a melting ulcer due the rapid destruction of the cornea. These ulcers can rapidly progress deep into the corneal stroma and may extend down to Descemet’s membrane, termed a descemetocele and may even cause corneal perforation. Deep stromal ulcers and descemetoceles are usually treated surgically, most commonly with a conjunctival graft. In this procedure, a piece of the conjunctiva (the pink portion around the globe) is sutured over the defect in the cornea. The graft provides structural and nutritional support to the healing corner. Medical therapy is also necessary after surgery, though often with a lower frequency of administration. Ulcers may also become complicated by a concurrent ocular condition. Keratoconjunctivitis sicca (dry eye) may prevent proper healing of a simple corneal ulcer, thus leading to a complicated ulcer. Abnormally located eyelashes (distichia, ectopic cilia) or abnormally oriented hairs (trichiasis) can rub the cornea, causing continued ulceration. The eyelashes my also be misdirected due to an eyelid abnormality known as entropion, where the eyelid rolls in toward the cornea. Complicated corneal ulcers can lead to significant corneal scarring. As with any disease, early treatment is the key to decreasing scar formation. After the ulcer has healed, medications may be recommended to decrease corneal scarring. In most cases, artificial tear supplements will be used on a permanent basis to prevent recurrence. Early aggressive treatment can preserve vision in most patients.